This Shires Chilren's Suede Half Chaps has a new and improved design. Made with a ripple elastic calf section, this kids English Riding Chap has a comfortable and better fit. 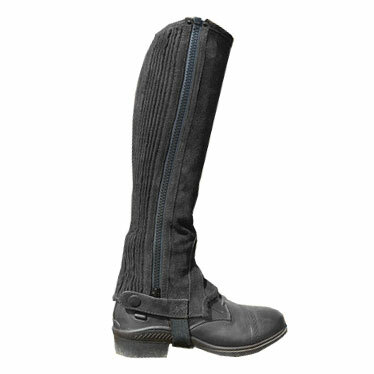 Complete with an elastic stirrup strap, zip closure snaps at the bottom, and extra protective padding on the inner leg. Pre-shaped design for a custom fit chap. Extra protective pad on inner leg.